Man Utd are reportedly not looking to replace Jose Mourinho as manager amid speculation linking former Real Madrid boss Zinedine Zidane with the post. The Portuguese tactician has come under fire this week after his side’s loss to Brighton at the weekend, with the manner of the performance and defeat in particular raising question marks. 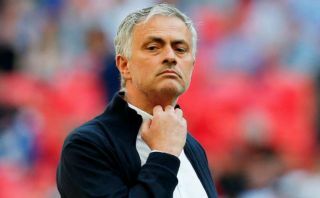 While Mourinho and his players will look to silence the detractors when they face Tottenham at Old Trafford on Monday night, it remains to be seen how the situation develops off the pitch if the Man Utd hierarchy are indeed planning a possible change. However, BBC Sport have reported that Mourinho still has the backing of the Red Devils, with their sources suggesting that they wouldn’t even need to talk about Zidane given there is no position available. “Why would we discuss Zidane when there is no job?”, the source is quoted as telling BBC Sport, while the Manchester Evening News have noted Zidane is the favourite to replace Mourinho. The Frenchman enjoyed a trophy-laden spell at Real Madrid before stepping down at the end of last season, with a La Liga title and three consecutive Champions League triumphs among others on his CV. In turn, particularly in terms of getting the best out of the attacking players at Man Utd with the likes of Paul Pogba, Anthony Martial and Marcus Rashford struggling to produce consistently, he could be a smart appointment to also change United’s style of play back to something that was engrained into the club under Sir Alex Ferguson. Nevertheless, it all appears mere speculation at this point based on the comment above from the Man Utd source, and so Mourinho will hope to pick up three points next week to not only alleviate some pressure off himself and the players, but also to quieten down the exit talk.